This is a very interesting, and memorable ghost film. A group of ghost finders enter an old Village Hall to find the haunting, that people are talking about, and also film it. Jerry the host, Mark the camera man, Anna the medium, Ian the Technical person. They are all your players. The locals have been feeling something, the children are scared to enter in the place anymore. People say they smell blood. So begins there journey into trying to solve or understand what is going on. The film displays itself as a learning episode, or a training video on what to expect, or do, during a haunting, and how to investigate it, and solve it. As Jerry talks into the camera, you the viewer flashback to older cases that have been filmed. There is an element of comedy in moments. There is a mix of found footage style of film making. The crew takes you through many styles of haunting, Possession, Poltergeist, Ghost, Beasts, and so on. This movie is with a basic 5 person operation, in one room, other than flashbacks, you stay in that room for the whole movie. Mark the camera man was once a major Ghost Hunter, he has suffered a mental break down, because of a passed case that almost destroyed him. Jerry the host, is a smug style character, who is more of the sophisticated character. Jerry at the start puts stuff off as non-chalant. As the movie moves forward, the situation grows deeper, twisted, and the ghost start playing tricks. Soon they realize that this is not just a mere haunting, and is more deadly, then they ever imagined. One of the flaws of the film is you the viewer have to figure out way these persons are doing this? How do they come up with or use some powers of protection without any definition. The movie lacks explanation on many things. It's not a huge flaw, but it is there. For an indie supernatural horror film, I think it’s a solid film. There are moments of creepy reality. Moments of funny humor. The acting is really good. I enjoyed each player, and there characterizations. Each one held their own, worthy to speak about, and give accolades to each performance. This was directed in the independent style, and works for the lover of lower budget films. It almost plays out like a TV episode of an anthology series, such as The X-files, or The Twilight Zone, or The Outer Limits. One series this film reminds me a lot of is the Showtime series Poltergeist. I was entertained, and it held my attention until the very end. I really liked the setup, storyline, and conclusion. The deeper the story transgresses, the plot becomes even more interesting, and the viewer finds himself wanting to know what happens next. Just when you’re satisfied the film moves forward, and becomes something even more then you thought it would be. Directed by Simon Pearce. This is his second feature length film. This is my second experience with his directing, and I think for this film, he did another good job. His first feature length film was the 2009 Drama, Shank, which is a wonderful film. Pearce has truly a natural talent in directing what he wants to display, and crafts that visual reality on screen in great detail. Written by Simon R. Green. 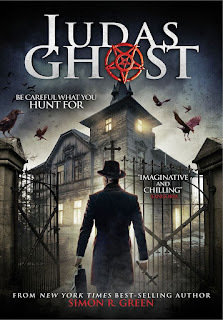 What I can tell, this is his first film as script writer, and he did a great job at creating a nice, tense at times, ghost film that adds humor, alongside a smart reality to this tired genera of ghost hunting films. There is a more originality to this film, because it creates a reality base around the haunting. This is actually based on his series of books. Simon is a wonderful author who has written many books of fantasy, horror, and so on. This film is an adaption of his, The Ghost Finders Series. As of this writing there is 6 books in the series. Martin Delaney is a phenomenal actor that has been in many wonderful films. He did a great job in this one as Jerry. The smug, down to earth, logical one who basically tries to keep his cool, and showcases an unimpressed reality toward the haunting. Equally impressive is actor Simon Merrells as Mark, the camera man, and the one who has a past. He gives a wonderful performance as the man living with the nightmare of his past, haunted by the reality of being involved with a haunting that killed his fellow ghost hunters. Simon is a great actor, most recently could be seen in the TV Series Dominion, and also The Tomorrow People. Also starring the beautiful Lucy Cudden. She gives a great performance as the medium Anna. She adds a personal touch to the story. Alexander Perkins gives a great performance also as the nerdy, techno, geeky, scaredy cat style persona. All the cast play off each other’s performances. Each one adds a depth to their characters. Graham Fox was creepy and disturbing in his character of the Ghost. He added a twisted performance. Overall this is a cool, logical, ghost film. A great little independent ghost haunting, supernatural horror film that gives a reality that would be good as a TV Series. It was very entertaining. Go into this wanting a low budget, with a Drive-in flare to it, and you will be satisfied. It has all the trademarks of a B-grade film, but with solid acting, some really cool special effects, and a great storyline.